The USS Defender (MCM-2), built by Ma- rinette Marine Corporation, Marinette, Wis., recently underwent propulsion trials. She is fitted with four 600-bhp Waukesha main die- sel engines, Hansome Electric propulsion motors, and Bird-Johnson shafting and con- trollable-pitch propellers. The primary purpose of the trial was to test the propulsion plant under full power and to perform essential combat systems alignment. Bird-Johnson controllable pitch propellers. The 224-foot vessel will be deployed by the U.S. Navy worldwide to sweep and neutralize mines. Marinette to produce two MCMs simultaneously in an environmen- tally controlled area. Wausau, Wis., has introduced a new line of generators to its already existing generator product offering. MagnaPlus provides powerful per- formance, easy installation and ser- vicing for any application with nine models to choose from, ranging from 70 to 280 kw. A top performer in every respect, MagnaPlus features provide a real choice in reliable pow- er generation and make it the ideal generator for marine installations, commercial buildings, hospitals, construction/rental fleets, or sys- tems where all or part of the load is nonlinear. Committed to electrical and me- chanical innovation and specializa- tion, Marathon Electric is dedicated to the design and manufacture of the highest quality electrical prod- ucts. The company has been manu- facturing fractional and integral horsepower motors and generators for over 75 years. Kvaerner Industrier for about $14.3 million, according to an announce- ment by the company. Fjellstrand is one of the leading suppliers of high-speed catamaran vessels for passenger and cargo car- riage. Upon completion of the acquisi- tion, Kvaerner indicated that it in- tends to merge Fjellstrand's activi- ties with its own. U.S. flag during the Persian Gulf crisis. Middletown from the U.S. flag to the Kuwaiti flag. Gas Princess, and Gas Prince, from the U.S. flag to the Kuwaiti flag. City, Sea Isle City and Ocean City will stay U.S.-flagged. At present, these vessels are in the process of complying with U.S. manning requirements. The ships, which have been operating under an exemption, have been given a Feb- ruary 11, 1990 deadline to comply. Industries (HHI) recently received an order from the West German shipping company Senator Line to build four 2,000-TEU container- ships. 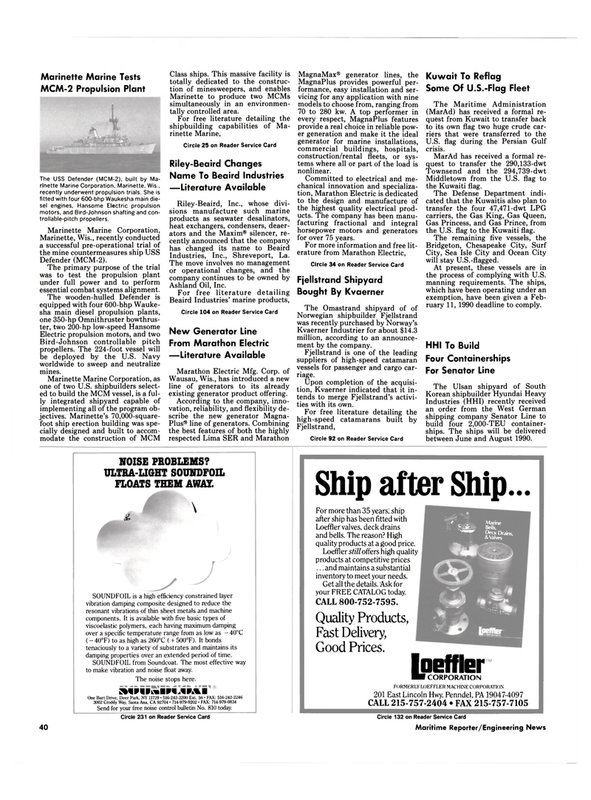 The ships will be delivered between June and August 1990. SOUNDFOIL is a high efficiency constrained layer vibration damping composite designed to reduce the resonant vibrations of thin sheet metals and machine components. It is available with five basic types of viscoelastic polymers, each having maximum damping over a specific temperature range from as low as - 40°C (- 40°F) to as high as 260°C (+ 500°F). It bonds tenaciously to a variety of substrates and maintains its damping properties over an extended period of time. SOUNDFOIL from Soundcoat. The most effective way to make vibration and noise float away. Send for your free noise control bulletin No. 810 today. Loeffler valves, deck drains and bells. The reason? High quality products at a good price. Loeffler still offers high quality products at competitive prices ... and maintains a substantial inventory to meet your needs. Get all the details. Ask for your FREE CATALOG today.